Thurston Moore moved to NYC at 18 in 1976 to play Punk. He started Sonic Youth in 1980. He edited the music and literary fanzines KILLER, Sonic Death, and Ecstatic Peace Poetry Journal and started the Ecstatic Peace records + tapes label. He has been on faculty at the Jack Kerouac School of Disembodied Poetics at Naropa University in the summer writing programme since 2011. His own writings have been published through various imprints. He has worked collaboratively with Yoko Ono, Merce Cunningham, Cecil Taylor, Rhys Chatham, John Zorn, Takehisa Kosugi and Glenn Branca. He has composed music for films by Olivier Assayas, Gus Van Sant, and Allison Anders. He presently records and tours both solo, with various ensembles and with his own band. His most recent recording with Deb Googe from My Bloody Valentine, James Sedwards, and Steve Shelley entitled The Best Day was recently released by Matador Records. 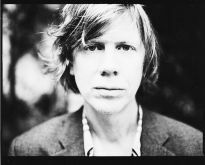 At present Thurston Moore resides in London and is editing a publication of Selected Lyrics and Poems, called "Stereo Sanctity" due out this summer.